The city founded by king Władysław II Jagiełło in 1424 AD on the western shore of the Vistula, opposite to the Teutonic Order’s city of Toruń (Thorn), was from the very beginning mentioned in the Polish historical sources as Nowa (New) Nieszawa or Nowe Miasto (New City) Nieszawa. 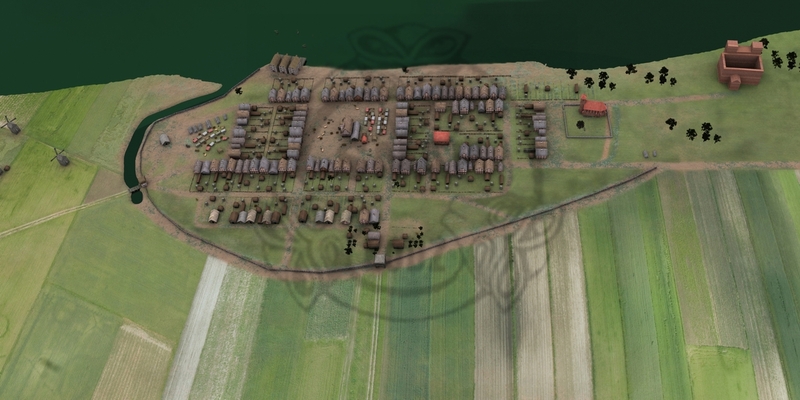 A multitude of historical forms by which the city was referred to and the fact that there were 3 settlements known as Nieszawa, located in various places and at different periods of time by the shore of Vistula’s middle course led the research team to refer to the studied site as Stara Nieszawa (Old Nieszawa). It was done in order to distinguish the historical town of Nowa Nieszawa opposite to Toruń from the younger Nieszawa, still existing ca. 30 km to the East. The project name Stara Nieszawa is referring to the city of Nowa Nieszawa that existed between 1424-1426 and which was discovered and reconstructed by non-invasive archaeological techniques. As Sławomir Jóźwiak mentions in his article published in the site’s monograph in 2015, the name of Nowa Nieszawa referred to the nomenclature present in the area that previously formed the territory of the Teutonic commandry of Nieszawa, called due to the location of the commandry’s seat by the settlement of Nieszawa (present Mała Nieszawka village). Polish historic sources refer to the later founded city under many names, such as f. ex. : Civitas Nowa Nyeschowa ante Thorun (1424), Nowemyasto (1425), Neschowa (1425, 1426, 1430), Nieschowa (1425), Nieschowa ante Thorun (1425), Nova Ciuitas (1426), Noua Ciuitas Nyeschaw (1428), Noua Nieschewa (1428), Nowanyeschwa (1428), Opidum Neschowa (1429), Nowaneschowa (1430), Opidum Neschavia (1430). Simultaneously, Teutonic documents refer to it as Neuwe Nessow (1426), Newnessow (1426), Nessow (1427) but most often as Stad Dybaw (1425), Neuwe Stad Dybow (1426), Dybaw (1427, 1428, 1430), Dybow (1427, 1431, 1432). The reasons why a different name for the city was used by each side in their documents is unknown. Nieszawa was founded west of the Dybów Castle, founded in 15th c. As an initiative of Polish king Władysław II Jagiełło. The settlement received municipal rights in 1424 , becoming Nowa (New) Nieszawa, Nieszawa or Dybowo. It existed in this place until 1462. The name was an association with an earlier settlement, located 3 km further to the west (at present Mała Nieszawka), where previously the first Teutonic Order’s castle on Polish lands was built in first half of 13th c. and subsequently demolished after signing of the Treaty of Mełno in 1422. 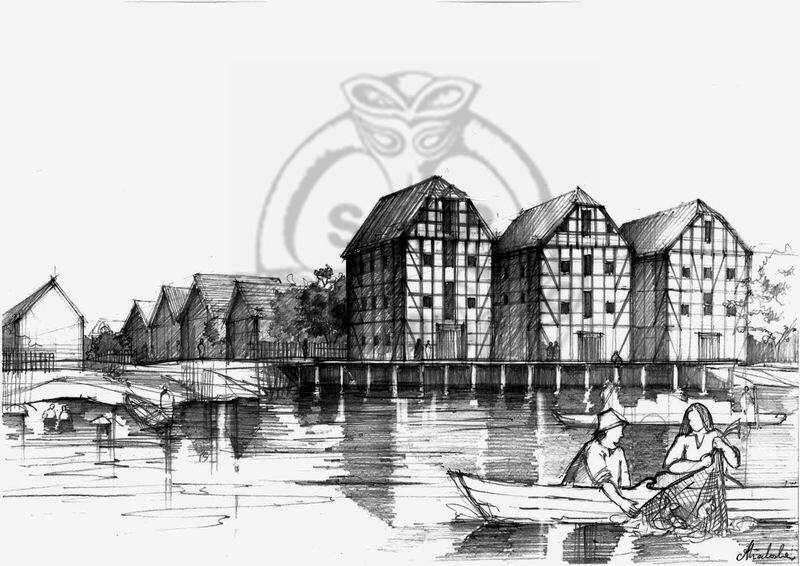 This „second” Nieszawa developed dynamically, benefiting from its location on the bank of the Vistula river, only one kilometre away from the walls of Teutonic town of Toruń (Thorn). This favourable location and rising income from river trade became reasons of socioeconomic tension between the Kingdom of Poland and Teutonic Order. After the rebellion of Toruń’s townspeople against the Teutonic rule and in appreciation of their involvement in the Thirteen Years’ War (1454–66), Polish king Casimir IV Jagiellon gave out a decree — according to the will of Toruń’s townspeople — to demolish the competitive economic centre at Nieszawa. The king simultaneously decided to relocate the city 32 upstream of Vistula, where Nieszawa exists to this day. 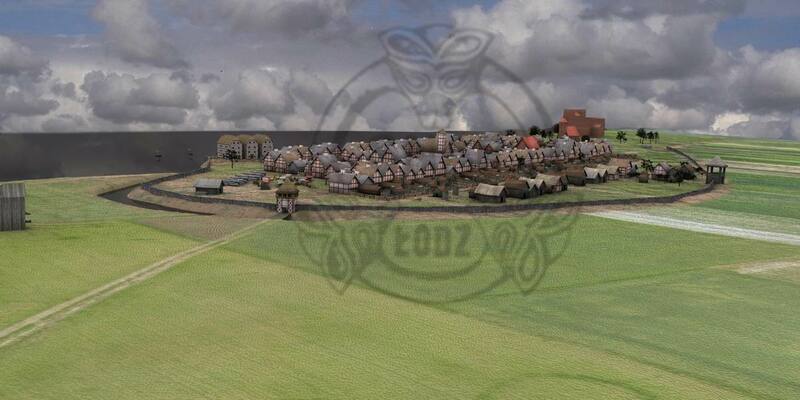 Today, the area identified with 15th c. Nieszawa consists of fields on the floodplain terrace in Toruń’s Podgórz district. These fields contain a time capsule with subsurface relics of a medieval town that existed for only 35 years. 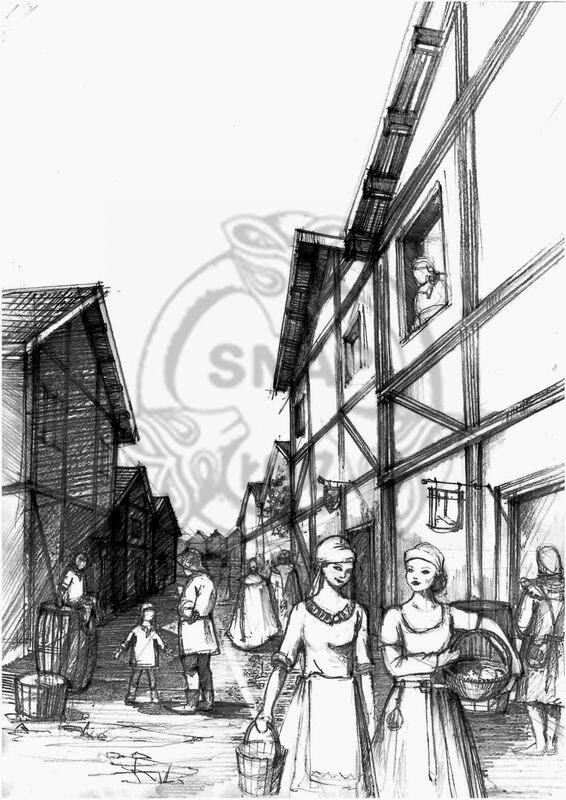 Nieszawa, was a town with over a thousand citizens, with a vast town square, carefully designed districts, regular street layout, market spaces, production zones and an impressive embankment-moat fortification system. It existed in the protective shade of the Dybow Castle as a resilient metropolis on the border between Kingdom of Poland and Teutonic state. Creation of such advanced urban organism required a serious effort of the Kingdom. Nieszawa developed dynamically and quickly rose during it’s short 35 year existance as a main trade competitor of the Hanseatic Toruń. 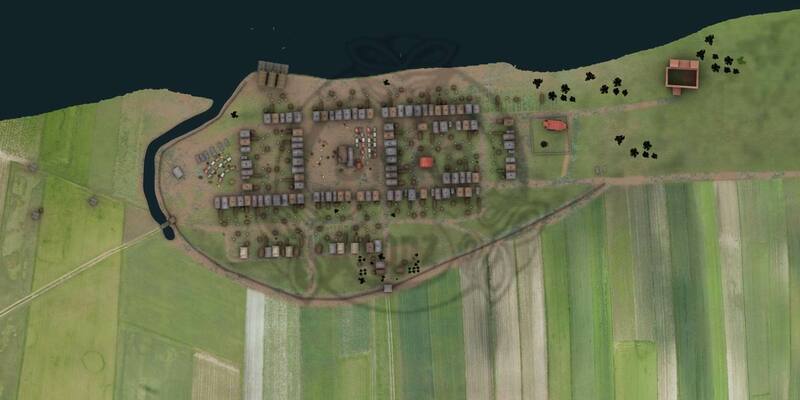 The breaking point in locating the location of medieval Nieszawa were the results of aerial survey conducted during 2001-2011 campaigns by archeologist Wiesław Stępień, who managed to document cropmarks revealing part of the urban layout. Basing on the results of trial excavations conducted by archaeologist Lidia Grzeszkiewicz-Kotlewska (1999-2001) a project for non-invasive survey with geophysical methods was written. During two years of fieldwork, magnetic prospection covered 32 hectares on the extent of over 1,2 kms, which places the survey as the most extensively conducted in Poland so far. 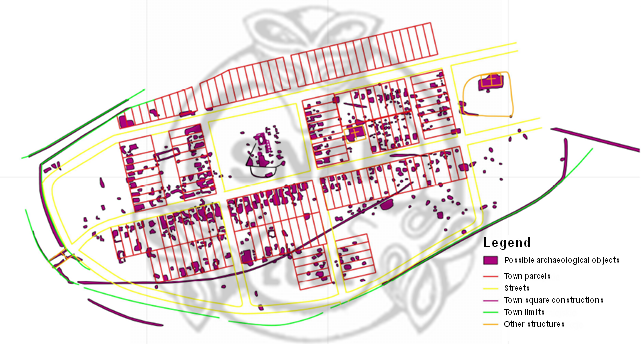 Additional soil resistivity measurements have covered 0,5 ha. In 2013 more additional fieldwork has been done with application of magnetic susceptibility measurements, a pioneer survey to the extent of 4 ha. The geophysical survey has been also aided by numerous techniques of aerial archaeology – photographic documentation with UAV drones, aerial prospection of the landscape of Vistula’s left bank and innovatory application of termovision. These informations have been complemented with numeric terrain model created with LIDAR ALS data. 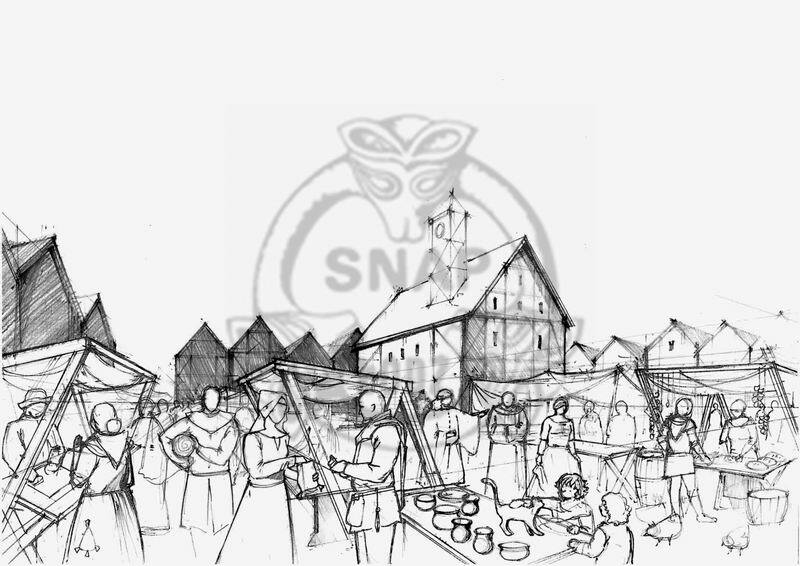 The central point of medieval Nieszawa was its main square with accompanying buildings, such as town hall, market stalls and the weight. On Nieszawa’s town square, measuring 140×140 m relics of building have been registered in the central and southern part. On the west side of the city, one section of buildings away a second space has been found, characterised by lack of features. 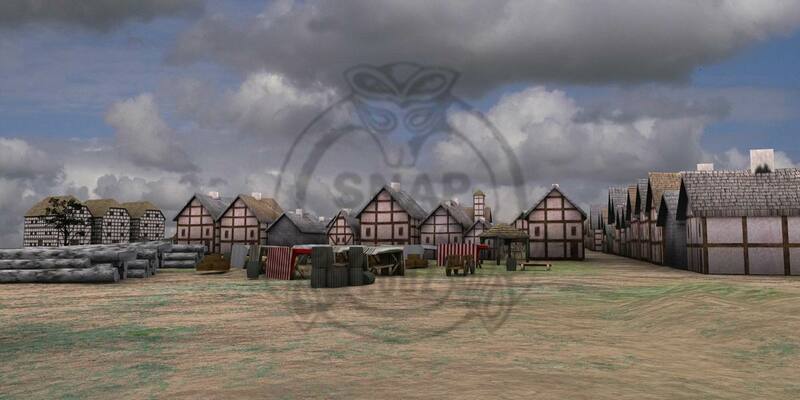 This place can be identified as a secondary town square, probably a market place, with dimensions similar to that of the main square. Similar spaces have been registered also in the south and east part of the city, south to the church of St. Nicolas. Archaeological digs in the area of the latter confirmed existence of relics of that building and of the accompanying cemetery. This area was probably just outside of the dense urban structure. Location of other sacral structures, among which the church of St. Hedwig (moved to modern Nieszawa in the end of 15th c.) is to be found, remains an open matter. To south, west and east from the town square, parallel streets led, starting at the corners of the square and creating main arteries of the town. Between them urban parcels were located, on which traces of constructions have been registered. The parcels were rectangular in shape, and their arrangement was probably compact in order to maximise the utilisation of available space. Furthermore, the structures can be identified as half-timber constructions, basing on the results of earlier archaeological digs. Among them, the residence of Stanisław Ciołek (1382-1437), bishop of Poznań, the Royal Secretary and vice chancellor of king Władysław Jagiełło is to be sought. The north district, although intensively studied, wasn’t unambiguously revealed, due to unsuitable prospection conditions, namely dense vegetation. The spatial model contains a north district, due to its traces being very clear and reliable in form of magnetic anomalies. 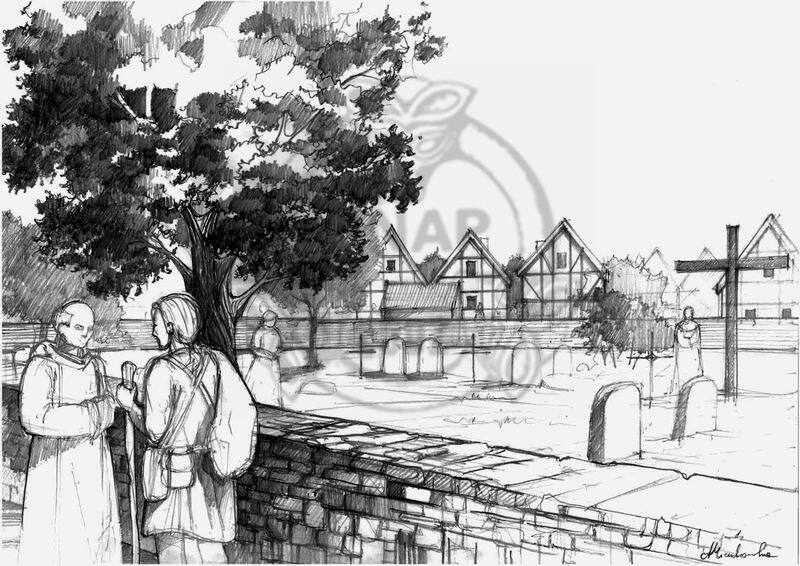 The most surprising discovery took place in the west and south area of the city, where anomalies identified with possible town fortifications have been found – probably that of a dirt fortification surrounding the town. 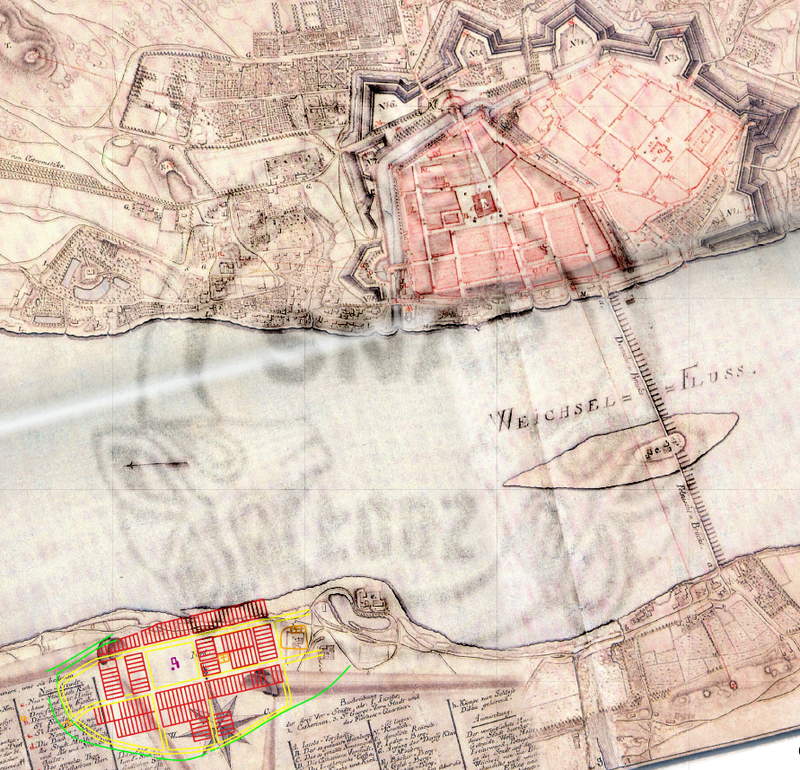 Although its outline is not possible to trace on the whole perimeter, we can presume that the fortification lines run from the bank of Vistula on the west to the proximity of Dybow Castle to the east. It is possible to initially locate the town gates, from which the most clearly registered is the west one, implemented into town’s fortification system. It is also clearly observable that the town in its north-western corner possesses a fortified moat connected with Vistula’s riverbed. This way the town was heavily fortified from the west and possible to enter only in the area of the mentioned gate, whilst from the west (on Toruń’s side) the Dybow Castle sheltered Nieszawa from any danger. 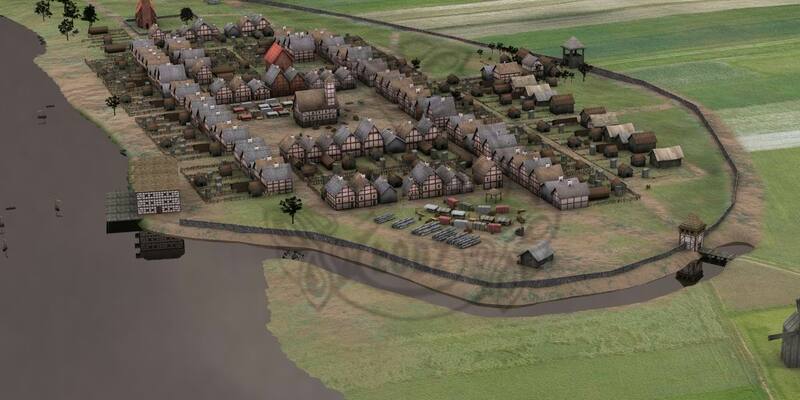 Nieszawa, appearing as a town with over a thousand citizens, with a vast town square, carefully designed districts, regular street layout, market spaces, production zones and an impressive embankment-moat fortification system existed in the protective shade of the Dybow Castle as a resilient metropolis on the border between Kingdom of Poland and Teutonic state. Creation of such advanced urban organism required increased effort of the Kingdom. Dynamically developing Nieszawa, has risen during not more than 40 years of existence as a main competition of the Hanseatic Toruń, successfully displacing its Teutonic rival in river trade. Having the Polish town’s economic and urban potential in mind it is possible to understand Toruń’s townspeople’s request allowing to get rid of commercial competition, and moreover Polish king’s decision to safely relocate the meritorious town. 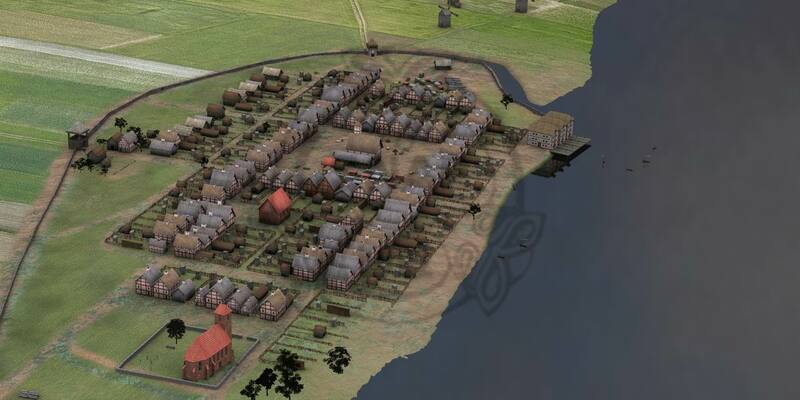 In the light of most recent research it is clearly noticeable that the whole effort of spatial organisation and planning was aimed at precise construction of a potent trade centre, which was to serve as a challenge, thrown by the Polish king against the Teutonic Order. Today, standing on the field covering relics of the medieval town we can hear church bells ringing both from Podgórz district and Toruń’s town square. 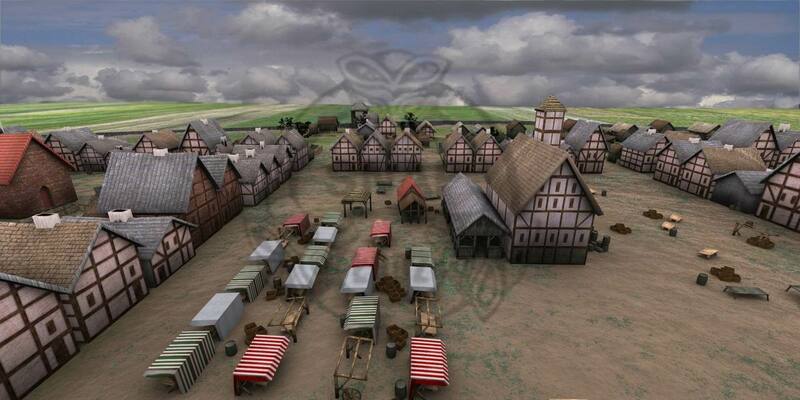 Yet during 15th c. it was possible to see a town growing each year, with the purpose of weakening the Order’s might. A twist of fate allowed the reconstruction of a hypothetical appearance of the heroic medieval town and restoring it back to life. 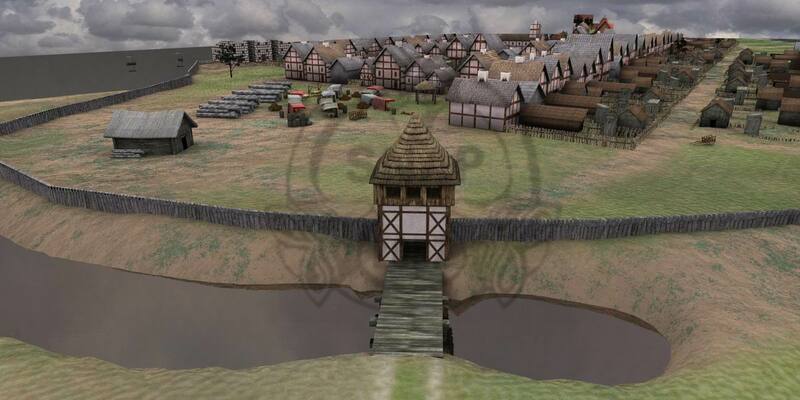 Consultations with specialists in the field of medieval urbanisation, dr Jerzy Sikora (Institute of Archaeology, University of Łódź) and dr Michał Starski (Institute of Archaeology, University of Warsaw) resulted in creation of a digital three-dimensional spatial model of old Nieszawa, which sums up the state of knowledge about the city and reconstructs it digitally for the state of 2013’s research.